Space provided for accessories, carrying strap, velvet lined. Hard, anodised outer shell, with a securely fitted aluminium valance. Clip over style latches. A flightcase is a transportation container used to safely pack and transport anything that needs protection. 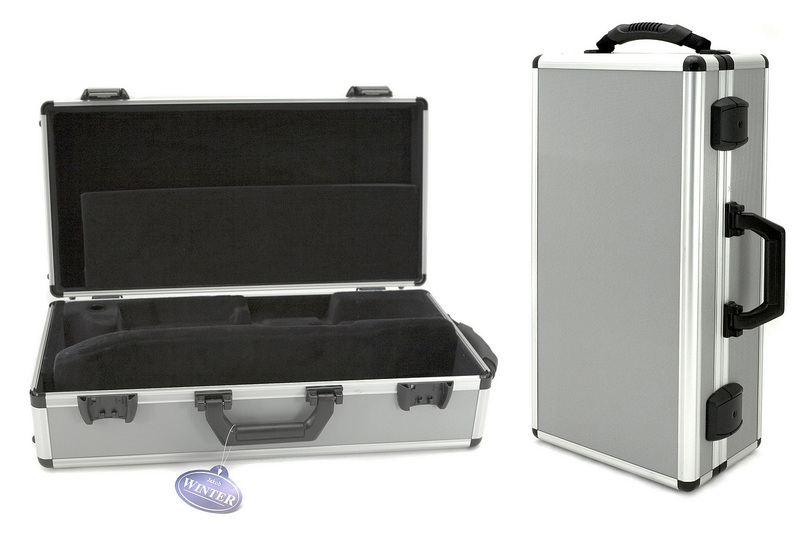 Flightcases have been used by musicians for many years. The most protective case money can buy. Rugged design; ideal for the musician on the move. Built like a tank, fits my Yamaha trumpet like a glove. There's a reasonable amount of extra space for a bit of music and other small accessories, but I can't quite fit my wee-zee or plunger mutes in which is a bit of shame. In every other respect, excellent. Very heavy (but good carry handles) and very well built flight case for trumpet. Same design inside as many cases made for Sonare and B&S professional trumpets. It was the standard case for the B&S artist line X model trumpets. Obviously it is wipe clean and rainproof as well. I dropped mine, instead of shattering it just got a scratch.